#UndertheSeaBurbank. 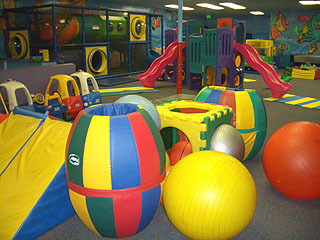 CBS Los Angeles named this the area’s best indoor playground. Kids go shoe-less and play on jungle-gym equipement. Your child will be entertained by activities such as the soft moon bounce, swings, slides, all in a colorful and stimulating environment. I have fond memories of taking my daughter to this beloved children’s indoor playground as a young toddler and attending many birthday parties here as well. It’s a great place to beat a “hot” afternoon this summer. They allow you to bring food. or you can order pizza and drinks there and it gets delivered. Tables, bathrooms, baby changing tables, all provided. Bring sanitizing wipes or gel as I did for prevention of spreading germs. That’s my only tip! Right now you can get a good value of either: $27 for 5 open-play visits or $49 for 10 open-play visits. Regular price is $9 a visit so get your deal! Click Here. 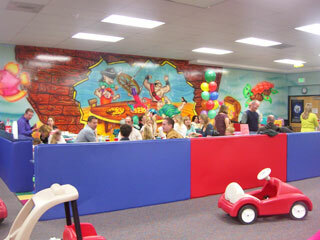 Parents can relax at tables while watching their kids play safely. On the 4th floor of Burbank Town Center Mall is a clean nice indoor play area. This is for little toddlers, I’d say up to 4 years of age. A good choice to beat the summer heat, free parking and close to the food court.